I recently read an interesting article about the paleo diet hype. It pointed out that it is being marketed way overboard as to what the original meaning of the caveman's diet was supposed to be; simple foods, minimally processed with short cooking times or even eaten raw. These days, you can find a vast amount of food blogs and cookbooks focusing on paleo recipes, or even more specifically, paleo desserts. The point of the article was that many of these blogs and cookbooks miss the point. While their ingredients are OK for a caveman's diet, the amount that is being used is beyond healthy. Think of cups full of coconut oils, nut meals, nut butters and honey that go into those sold-as-healthy paleo recipes. The sheer amount of these ingredients makes them very calorie-dense dishes that makes overeating almost unavoidable. This is not really breaking news if you think about. But have you thought about it? It's actually quite easy and tempting to be lured into those hypes that make you believe you are doing something good to yourself . Along the way, you may loose touch with reality. Moderation is the key. That's probably not new to you either. If you cook your dishes from scratch, you may have an idea how much nuts go into nut butter. If you look at the oil in your measuring cup, imagine having a few spoonfuls. Same with the honey or other sweetener. How appealing would these foods be when eaten separately and unprocessed. You would surely eat less than when they all combined and baked into some delicious cake or brownies. This applies to my recipe today, roasted chickpeas, a delicious and healthy snack. 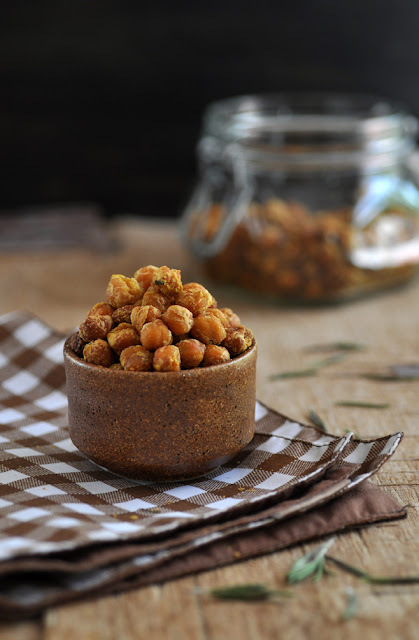 While all ingredients - chickpeas, nutritional yeast, sea salt, rosemary and a little olive oil - are surely not unhealthy when eaten in moderation, it is quite easy to snack away on these and finish a whole can of chickpeas without even realizing. And that is not a full meal, it's still just a snack. Do you get my point? You can still overeat or have health problems, or have problems to loose weight, when you follow one of these healthy diet hypes - be it vegan, paleo, gluten-free, etc. Common sense, listening to your body's signals and moderation shall help keep your health and weight under control. In a large bowl, combine all ingredients and stir until chickpeas are evenly coated. Spread the chickpeas in one layer on a baking sheet. Better results are being achieved if the chickpeas are not too crowded. Roast in preheated oven for 60 to 75 minutes ( or even longer), depending on size of the chickpeas. They are ready when they are crunchy, and not chewy anymore. If the chickpeas loose the crispness after a day or too, roast them again at 165C/350F for 10-15 minutes and leave them in the warm/switched-off oven for another 15-20minutes.